How Successful Was the Marjah Operation? By adding to entitlements, Boot says, the health care bill will squeeze military spending and thus endanger America's superpower status. Boot marshals some meretricious evidence to imply that DOD budgets have somehow been going down. But using military spending-to-GDP ratios as he does is highly misleading and is a favorite tactic of Pentagon hucksters to create the illusion of declining budgets — a circumstance (wholly fictitious) which must, in their minds, be rectified by ever greater future spending. Percentage-of-GDP calculations, however, would probably show every country on earth, with the exception of North Korea, has declining military spending trends over time. In terms of actual inflation-adjusted dollars spent, nevertheless, the United States now spends more on its military than at any time since World War II: more even than at the peak of the Korean war and Vietnam war. Remarkably, it spends more than the rest of the world put together. Boot bemoans the shortage of his beloved weaponry: why does the Navy only have 283 ships, and why will it have severe trouble replacing even this small number? But it has been obvious for years that the numbers of major weapon systems in DOD's inventory have declined — and will decline further still in the future — because DOD's leadership is perfectly content that this should occur. Why else do they procure (and the word "procure" aptly suggests an element of prostitution to the military contractors) $5 billion destroyers and $10 billion aircraft carriers? Isn't it patently clear that one cannot replace older systems on a one-for-one basis if the new system costs two to five times as much on a per-unit basis? This doesn't just apply to the Navy. The decline of the Air Force, which Boot laments, is equally the result of such technological filibustering. The F-16, a perfectly serviceable low-end fighter which could be produced in volume at about $30 million each, is intended to be replaced by the F-35 at $131 million per copy, according to the Government Accountability Office. It is plain that the Air Force cannot replace the 1,200 F-16s in the total active inventory with F-35s at anything approaching a one-for-one rate. Nor is it altogether certain that the F-35, a seriously overweight air frame stuffed with immature software and possessing the flight dynamics of a brick, is capable of replacing the F-16 even qualitatively. The reason these projects are conceived as they are and burst into postulant fruition is because that is how the Military Industrial Congressional Complex likes them. Present day military contractors would be completely incapable of producing utilitarian weapons at one-tenth the rate they were produced in World War II. But they don't have to: as long as they provide lucrative board memberships and consultancies to retiring generals they can crank up their profits by conceiving monstrously expensive programs that remain in research and development for years, if not decades, and require very little "touch" labor but a lot of billable overheard. A program, having already been pitched to and approved by the strangely amenable generals, is then locked in by a shower of political contributions to the right committees on Capitol Hill. When the whole rotten scheme is finally revealed to be 100 percent over budget and years behind schedule, it is either canceled at the convenience of the government (meaning no harm to the contractor, who bids on the very next project), or is so reduced in quantity that the unit cost skyrockets and the military service disingenuously decries the result as an inventory shortfall because of alleged "budget cuts." Such is the system Max Boot so gloriously miscomprehends, that he thinks should spend ever increasing sums, in perpetuity. And for what? So that lap-top bombardiers like himself can vicariously experience the thrill of other Americans tromping about various pieces of unpleasant third world real estate playing "globocop," as he himself puts it without apparent irony. Apparently the establishment also seeks to trade away the public's health. Regardless of what one thinks about the specific health care legislation that passed, the idea that the health of Americans should be sacrificed — when U.S. life expectancy is already near the bottom of the list among OECD countries — so that neocons like Boot can repeat criminal mistakes like the invasion of Iraq, shows the depth to which political discourse in this country has sunk. If health care legislation creates spending that is unsustainable in the long term, by all means amend it to make it less expensive. But any savings should either pay down the debt or be remitted to the taxpayer. Giving the proceeds to the Department of "Defense" would be worse than flushing the money down the drain: it would create more rapacious criminal corporations like Halliburton, more sinister private armies like Blackwater, and more interventions with a potential for lethal blowback. From 1948, at the dawn of the Cold War, through the Obama administration's pending budget request for 2011, the Department of "Defense" has spent or will spend $28.4 trillion in inflation-adjusted dollars. This is the same organization that couldn't even defend its headquarters on 9/11 — and it wants even more funds to perpetuate the status quo? "ObamaCare and American Power," Max Boot, the Wall Street Journal, March 25, 2010. "Department of Defense Budget FY2011 [.pdf], see pp. 61-67. "Is This Fighter Jet Worth $131 Million? ", AOL News, March 12, 2010. "The U.S. is stuck in the Cold War," Michael Lind, Salon.com, March 30, 2010. Much has been made of President Obama being blindsided and humiliated by the announcement of new settlement construction in East Jerusalem, made by Israel Prime Minister Netanyahu's government during the visit to Israel by Vice President Biden, on the eve of the so-called proximity talks with the Palestinians, negotiated so painstakingly by George Mitchell. Netanyahu insists all of Jerusalem is the indivisible capital of Israel and therefore not subject to negotiation. His claim to East Jerusalem (and by implication most of the land in the West Bank) derives from a theory of historical precedence that says the original inhabitants of that troubled land have an exclusive right to ownership of that land, and that the Palestinians, being more recent inhabitants, have no equivalent right, even though they may have legally owned that land prior to 1967 and have resided on it for many generations. Professor Juan Cole thoroughly debunks this preposterous theory in the blog entry: The Ten Top Reasons East Jerusalem does not Belong to Jewish-Israelis (also attached below). But Netanyahu's claim could be even more ludicrous than Professor Cole so ably demonstrates. That is because Cole notes but does not address the truly devastating implications of the hypothesis analyzed by Hebrew University Professor Shlomo Sand in the controversial international best seller, Invention of the Jewish People, Verso Press, 2009. Sand, a scholarly historian with the character and courage to follow his analysis wherever it may lead, contends in this well documented historical study of the Jewish diaspora population that much of that population is really descended from indigenous peoples who converted to Judaism (e.g., Berbers in North Africa and Spain, Khazars in what is now the Ukraine, pre-Islamic Arabs in Yemen, etc.) rather than being descendants of the relatively small number of Jews who were expelled from Palestine by the Romans after the destruction of the 2nd Temple in AD 70. Sand's analysis raises raises a fundamental question of whether Jews should be defined by religion (like Christians, Moslems, Buddhists, and Hindus, for example) or by racial/ethnic exclusivity (i.e., by genetics) -- a question that is explosive in Israel. If Sand's hypothesis is correct, the implications are profound: The Palestinians are probably closer genetically to the Jewish expellees from the second temple than the overwhelming majority of non-arab Israeli citizens, who are either descendants of Eastern Europeans (like Netanyahu's Polish forebears) or recent immigrants (especially from North Africa or Russia), like the ex-Ukranian bar room bouncer, Israeli Foreign Minister Avigdor Lieberman. And by being the descendants of converts, these Israelis would be about as closely related genetically to the Jewish expellees from the second temple as the descendants of Ivan the Terrible or Sitting Bull, thus turning Netanyahu's theory of historical precedence on its head. 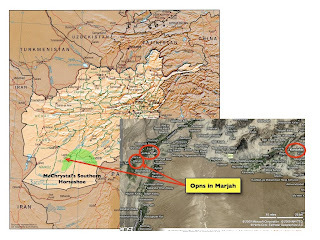 The winter offensive in Marjah has been portrayed by US authorities as the successful poster child of Nato commander's, General Stanley McChrystal, new counterinsurgency strategy. Yet some of the information fed to the American public has been misleading, possibly the result of systematic misinformation by the Pentagon designed to convey a false impression of "a large and loud victory" -- the goal of which is to convince the American public of the need for longer war than implied by President Obama's "escalation and then leave" speech. Moreover, as Gareth Porter pointed out, most reports erroneously depicted Majah as a city of 50-80,000 when, in fact, it is an irrigated rural region made up of scattered farms, hamlets and small villages. Bear also in mind that General McChrystal telegraphed his punch into Marjah with a public campaign advertising the looming offensive months before it commenced. Predictably, Taliban melted away to fight another day, leaving lots of land mines (pretentiously called IEDs or improvised explosive devices by the Pentagon), and Nato forces moved in with relatively light casualties and are now spreading out to occupy the region. Marjah is now off the radar screen that governs perceptions in the sound-byte addicted hall of mirrors that is Versailles on the Potomac. Yet over the coming months, the occupation of the Marjah region -- the "hold" part of the "clear-hold-build-leave" counterinsurgency strategy -- will make our forces dependent on long vulnerable lines of communication for supplies and their outposts vulnerable to attacks in detail. Referring the following map below, the green shaded area, which approximates the arc of pacification in McChrystal's counterinsurgency strategy, gives an idea of you serious these vulnerabilities will be. It is made of thousands of farm coumpounds, hamlets, and small villages. Marjah is in the west, about 200 miles from Qandahar in the east. And now .... General McChrystal's headquarters is letting it be known that the next target is Qandahar, a Pashtun majority city of about 500,000 inhabitants (perhaps as many as a million, if one includes the surrounding regions), and remains a violent Taliban stronghold. Before getting enmeshed in a Qandahar offensive, the scale of which will make Marjah look puny, it might be be wise to have a dispassionate lessons-learned assessment to determine whether or not the outcome of the Marjah operation did in fact provide a stable strategic launching pad for a full blown assault on Qandahar. The information in the attached report by Chris Sands in the National (UAE) adds importance to this question. KABUL // When US-led forces launched a major attack on a small corner of south-west Afghanistan recently, the operation was accompanied by a blizzard of military activity and media attention not seen since the war began almost nine years ago. Will It Mutate Into Yet Another Disaster in the Middle East? The contemptuous treatment of President Barack Obama and the United States by the Israeli government led by Prime Minister Binyamin Netanyahu is setting the stage for a continuing string of disasters in Middle East. Netanyahu just stuffed it to Obama by continuing settlement expansion, despite Obama's humiliating pleas to freeze that expansion in the interest of restarting the pusillanimous "indirect" peace talks. At the same time, Israel's increasingly belligerent rhetoric suggests it is spoiling for a preemptive strike on Iran's nuclear facilities ... at attack with unknowable adverse consequences for the United States and the world, according to the American Chairman of the Joint Chiefs of Staff Admiral Mike Mullen, a patriotic canary in the coal mine who is vigorously trying to dissuade the Israelis from this crazy option. These are only the latest installments of the successful strategy of Mr. Netanyahu and his arrogant colleagues to turn the hopes and dreams unleashed by President Obama's Cairo speech into a distant, humiliating memory. Now, yet another complication is looming for our hapless President: According to a 9 Mar 2010 BBC report, both Israel and Syria just informed an OECD energy conference they wanted to build nuclear power plants to reduce their dependence on fossil fuels. On the surface, one could argue that these are not unreasonable requests, at least when one judges them in the context of President Obama's intentions to do exactly the same thing in the United States, albeit in the interests of reducing CO2 greenhouse gas emissions. Moreover, each nation could claim a greater need for nuclear power than the US, because the US has far greater reserves of coal, oil, and natural gas per capita that either Israel or Syria. Of course the Middle East is not even close to being a reasonable world, and if past is prologue, Israel's "peaceful" nuclear ambitions will be treated very differently from Syria's, or those of any other Islamic country, for that matter. This bias could inflame tensions, further undermine our position in Middle East, and encourage even more aggressive behavior on the part of Israel, which is behaving more and more like a spoiled adolescent bully than a mature nation trying to find moral legitimacy in a civilized world. Notwithstanding Netanyahu's clear contempt for Obama, we should not be surprised if Obama eventually caves in to support Israel's request and even agrees to supply financial aid to fund Israel's proposed reactor. Indeed, we might even expect that such aid to be coupled with an Israeli promise to buy US weapons technology (with money we lend to Israel before forgiving the loan). Moreover, at the same time, it is probable that Mr. Obama or Secretary Clinton will end up denouncing Syria's parallel effort to build a civilian nuclear power capacity as an example of unprincipled, destabilizing aggression. The unbalanced treatment of Israel's nuclear ambitions has already reached absurdly dangerous levels, particularly given Israel's bullying belligerence to its friends and foes alike. It is reflected in the double standards applied to enforcement of the non proliferation treaty (NPT), which all the members of the international Atomic Energy Agency (IAEA) are supposed to sign. The NPT aims to prevent the spread of nuclear weapons and weapons technology, to foster the peaceful uses of nuclear energy, and to further the goal of disarmament. The Treaty establishes a safeguards system under the responsibility of the IAEA, which also plays a central role under the Treaty in areas of technology transfer for peaceful purposes. Both Syria and Israel are members of the IAEA; indeed Israel is one of the founding signers of the IAEA statute in 1957; while Syra signed it in 1963. However, in accordance with the statute, Syria signed the NPT, but Israel did not not and still refuses to so. That is because, as we all know, Israel has a long standing nuclear weapons program that goes back to decisions made in 1949. Today, Israel has the only operational arsenal of nuclear weapons in the Middle East. Although Israel has never acknowledged this capability under its so-called policy of strategic ambiguity, its weapons are an open secret. Classified US intelligence estimates of the Defense Intelligence Agency, made public on 22 Feb 2004 in a UPI report, concluded that Israel had an operational arsenal of 82 nuclear weapons (i.e, weapons + the means of delivery). And in 2008, the Joint Forces Command actually let the classified cat out of the bag in its unclassified Joint Operating Environment report (page 37) with a generally worded statement confirming the existence of Israel's nuclear capability. Most estimates of Israel's nuclear arsenal range from 80 to 200 weapons. Israel is the only country in the Middle East possessing an arsenal of atomic weapons as well as the means to deliver those weapons. In 2005, President Bush approved a deal to supply India with nuclear fuel and technology for civilian reactors. Bush approved this deal, knowing full well that India, like Israel, has an operational arsenal of atomic weapons, and that India, like Israel, has not signed the non proliferation treaty, even though India is, like Israel, a member of the IAEA. In fact, India is currently on the IAEA's board of governors! The Obama Administration has taken Bush's plan a step further by agreeing to an even more cynical deal that couples the sale of two US nuclear reactors to a promise by India to buy weapons from US manufacturers (at stake is a $12 billion competition with European aircraft manufacturers to buy 126 fighter aircraft for the Indian Air Force). President Obama is exploiting the liberal hysteria over the anthropogenic global warming hypothesis to resurrect the US nuclear power industry. By this action, he is also unleashing the reinvigorated domestic lobby of the nuclear power industry, even though the primary criticism that put a stop to the expansion of nuclear power -- the question of how to protect our citizens from the deadly threat of highly toxic nuclear waste materials -- remains a clearer and more present danger than any of the hypothesized threats of global warming. We can expect, therefore, a natural alliance to emerge between the powerful nuclear lobby and the powerful Israeli lobbies to push for US aid to Israel with respect to its sale of nuclear technology under the auspices of existing US security assistance policies. Thus, it may be only a matter of time before Mr. Obama's "green" policies are hijacked by the very Israelis who hold him in contempt, setting up a deal in the form of arms-nuclear power plant swap similar to that being proposed for India, except on more generous terms, given our government's predilection for exporting front line technology and forgiving loans to Israel. Should such an outcome transpire, it will serve to increase the blatant hypocrisy of our probable opposition to Syria's (or any other Islamic country's) ambitions to produce nuclear reactors for civilian uses. Such an outcome will also work to further isolate the moral position of the United States in the Islamic world and encourage more of them to obtain atomic weapons, if only for their own defense. Moreover, by rewarding Israel, a country that holds the US government in contempt, such an outcome will merely serve to intensify that country's contempt and its bullying belligerence. But today, like the India deal, these probabilities remain below the public's radar screen while lobbyists beaver away in the back rooms of Versailles on the Potomac. The Obama Administration’s clear-hold-build-leave strategy in Afghanistan is crucially dependent on the Afghan’s central government’s ability to displace the Taliban with clean local governance throughout a rugged country larger than Texas, with a population of 28+ million, where the vast majority of people live in small hamlets and villages. To this end, the combined forces clearing operation in Marjah, a poppy growing area of home to about 80,000 in southern Helmand Province, was to be a model operation. After clearing out the Taliban and setting up a “Hold” zone (a series of positions outside of town occupied by two battalions Marines and Afghan forces to secure the area), the operation was to be followed by the cookie-cutter installation of what the commander, General Stanley McChrystal, called a “government in a box” -- which to work, must be an honest government that will immediately go to work at improving the lot of the locals. As usual, the Taliban, like all competent guerrilla forces when faced with superior firepower, bugged out ahead of the combined Nato-Afghan sweep through Marjah. Now, as Jeffrey Fleishman reports in the 7 Mar 2010 issue of the LA Times, it is beginning to look like McChrystal’s “government in a box” will be led by a typical thuggish representative of the morally challenged Karzai clique, which has a history of plundering those they rule. It turns out that the new leader, Abdul Zahir, a man who vowed “to bring back dignity and prosperity” to Marjah (a fertile opium growing area), stabbed his own son, was convicted of manslaughter, and served time in a German slammer. Just the sort of man to win the hearts and minds of those he rules. The Marjah operation is off the front pages, and recent reports indicate the next target in our new strategy is the much more formidable Pashtun city of Qandahar, with population of about a million. But Marjah is not over. The people of Marjah know the Taliban are lurking in the shadows, waiting to install a another shadow government, when the US inspired “government in a box” does not win their hearts and minds, and the US focus of effort is elsewhere. As I indicated in CounterPunch on 3 February 2010, the Quadrennial Defense Review (QDR) just released by the Obama Pentagon is a bad joke. That bad joke is about to be given the good housekeeping seal of approval by a special panel appointed jointly by the Secretary of Defense and the defense barons of the Armed Services committees in Congress. When this happens, rest assured, any desire to get control of the out-of-control defense budget will plunge far below its already low level. Chalk up another victory in the Military - Industrial - Congressional Complex’s (MICC’s) war on the Constitution, the American taxpayer, and programs like Social Security and Medicare, which are hallmarks of civilized society. First, with a few exceptions, the Obama QDR approved a defense budget and a long range program plan that will not buy enough new weapons to replace the weapons in the inventories of the military forces in a timely manner. Consequently, the average age of these weapons, already at a post WWII high, will continue to get older at an accelerating rate. Given this situation, the only way to reduce the growth in average age will be to retire the oldest weapons without replacement, thereby shrinking the size of the forces yet again, in effect continuing a devolution that began as early as 1957 (see Defense Death Spiral, especially pps. 21-25). The economic roots of the force structure meltdown lie in the MICC’s obsession with modernizing with ever more costly and technically complex weapons. This obsession creates a political economy wherein unit costs (i.e., the cost of the “parts”) always rise faster than budgets (i.e., the cost of the “whole”). This creates a situation a little like cancer cells metastasizing in a body; something has to give. The asymmetric economics of defense lead to the declining production rates and age growth described above which, in turn, create extortionary political pressure (caricatured by vacuous slogans such as the “hollow military” in the late 1970s or the so-called “procurement holiday” in the mid 1990s) to justify increases in the total defense budget. But increasing the budget, as we did after 1976 and after 1994, actually accelerates the rate of cost growth and thus restores the cancerous asymmetry between cost and budget growth, albeit at a higher budget level. This sets the stage for yet more political pressure to increase the defense budget even further, as the extortionary loop folds back on itself to amplify itself -- over and over. Over time, cynical gaming strategies, evolved though trial and error, create and/or exploit this pattern of economic behavior that benefits the “parts” at the expense of the “whole.” Whether these strategies, now known as front loading and political engineering, are the “chicken” or the “egg” is now immaterial, because today, they are ubiquitous and lie at the center of an organic, self-regulating devolution. So, the asymmetric economics of cost growth greater than budget growth create continual political pressure to bail out a collapsing modernization program. There are essentially two short-term ways for responding to this pressure: (1) decision makers can reduce current readiness for combat in order to transfer money out of, or by slowing the future rate of money growth into, the operating budget (by reducing training tempos, purchases of spare parts, etc.) and then pump the “savings” into the modernization budget, or (2) they could simply increase the total defense budget. Generally, decision makers opt for a combination of both in the short term, but over the long term, the only option is to change their obsessions, which is unthinkable, or to increase the budget, which is the real name of the game. Second, the Obama QDR also failed to address how the modernization problems described above (i.e., increasing technical complexity + increasing age of weapons) mutually reinforce each other to compound the DoD’s economic problems by creating a phenomenon known as the rising cost of low readiness. This makes it ever more difficult to rob the readiness budget to pump up the modernization budget. The subtle cause and effect relationships underpinning the rising cost of low readiness are explained in the Defense Death Spiral, especially pps. 24-45. For our purposes, it is sufficient to say that the net result is that unit operating costs (i.e., the cost of operating the “parts”) also grow faster than defense budgets (i.e., the cost of the “whole”) and the economic effect becomes a variation on the cancerous theme described above. Third, and perhaps most importantly, the Obama QDR failed to even acknowledge, let alone address, the related problems posed by unauditable, corrupt, financial management systems -- by this I mean both the historical accounting systems and the program planning systems of the Planning, Programming, and Budgeting System or PPBS. As I explained in both the Defense Death Spiral and my last statement to Congress, not to mention in a public hearing over nineteen years earlier, in March 1983, before the Armed Services and Budget committees of of the Senate -- a hearing that resulted in a cover story for Time Magazine (7 Mar 83 issue), cynical bureaucratic gaming strategies systematically corrupt the information flowing though the Pentagon’s central management information system (i.e., the PPBS), which in any event is logically flawed (see, for example, my statement to Congress, beginning on page 15). This makes it impossible to assemble the information needed to sort out the first two problems and to devise appropriate recovery strategies that are based on an understanding of those problems. In this sense, the corruption of the Pentagon’s PPBS can be thought of as bureaucratic grease lubricating the political-economic engine that is protecting the status quo. So, it should not be surprising that our political system is unable to shape rational defense policies and strategies in response to changing conditions, such as adapting our forces while providing a peace dividend to reflect the changes brought about by the end of the Cold War. Put bluntly, the Pentagon’s corrupt bookkeeping system is the turd in the national security punchbowl. All the players in Versailles on the Potomac have known about it for years, but no one wants to do anything about it, because flushing it out would end their party. It is not fair to blame President Obama’s political appointees in the Pentagon for this state of affairs, because as I have endeavored to show, it has very deep roots. On the other hand, it is eminently fair to blame Obama’s inept Office of the Secretary of Defense, particularly the spectacularly incompetent Office of the Under Secretary of Defense for Policy, for not even acknowledging these problems in a QDR it spent almost a year putting together. It would be absurd for the Obama Pentagon to plead ignorance for its obscene omission. After all, Obama’s QDR is only the most recent variation of a bad joke begun in the Clinton Administration with its publication of the fatally- flawed first QDR on 19 May 1997. Of course, the Clinton Administration was merely continuing the pathological planning practices of the Reagan Administration, which I described in excruciating detail during the March 1983 congressional hearing. And bear in mind, the Reagan Pentagon was merely continuing the bureaucratic pathologies the military reformers began to document in the 1970s -- behavioral pathologies that we now know reached back at least to the inception of the Planning, Programming, and Budgeting System by Defense Secretary Robert McNamara in 1961 and probably earlier. Given the staying power of the defense power games, no one should be surprised that the end of the Cold War resulted only in temporary marginal reductions in the defense budget; nor should we be surprised that twenty years later, the United States is spending more on defense than it did at the height of the Cold War, when we stood toe to toe with the Soviet nuclear-armed superpower, yet had enough extra resources to fight very hot wars in Korea and Vietnam; nor should we be surprised that today we are spending as much on defense as the rest of the world combined. Bear in mind, as I showed in my 2002 statement to Congress, the so-called global war on terror has very little to do with this current budgetary state of affairs. It should be clear, therefore, that the Pentagon has deep systemic problems, and that the most recent QDR, like its predecessors, papered them over, to put it charitably. Now, with this background in mind, let’s turn our attention to the QDR review panel that is about to “fix” this disastrous state of affairs. Congress created a special review board in 2006 to analyze the 2010 QDR in order -- don’t laugh -- to provide the Congress with what it called an independent alternative view of the QDR. The 20 members of this review board were to be appointed by the Defense Secretary (12) and the senior Republicans and Democrats of the Senate and House Armed Services committee’s (8). On 1 March 2010, Ray Locker and Ken Dilanian of USA Today authored a front page report that described and analyzed the makeup of the 20 members of the QDR review committee. Locker and Dilanian showed that “eleven out of twenty members “work for defense contractors as employees, consultants or board directors,” raising obvious questions of conflict of interests. Foremost among these is the panel chairman, William Perry, a long time Democratic defense operative who served in the Carter and Clinton administrations and made a fortune in the defense industry when he moved back and forth through the revolving door. Perry has been one of the most vocal and slickest salesmen of high tech defense systems, especially robots. While Secretary of Defense, Perry did nothing to correct the three problems described above, and in fact, he made them far worse by promoting new cold-war inspired high complexity, high-cost weapons just as the Cold War was ending -- most significantly, the problem-plagued Joint Strike Fighter, which is on track to be the most expensive program in the Pentagon’s history. Today, the Obama administration’s Pentagon is well populated with Perry’s proteges. Locker and Dilanian did an adequate job of identifying contractor connections for the eleven members of the panel; that is bad enough, but their report dropped the ball on highlighting the likely biases of the other members. * Center for New American Security (CNAS): John Nagl, president. Nagl has been closely tied to the Obama administration’s advocacy of the AFPAK war and his organization serves as a mouthpiece for the Pentagon's war policies. There is no indication Nagl knows anything about the decision making pathologies discussed above. But his predecessor as president of CNAS, Michelle Flournoy, is now the Under Secretary for Policy in the Pentagon and can be regarded as the key architect of the QDR. * The Center for American Progress (CAP): Senior vice president, Rudy De Leon, is a former Deputy Secretary of Defense in in Clinton Administration. De Leon did nothing to clean up the Pentagon’s bookkeeping mess as DEPSECDEF, even though he was well aware of these bookkeeping problems from the mid-1980s forward, when he worked for Congressman Nick Mavroules (who ended up in the slammer for racketeering). * Center for Strategic and Budgetary Assessments (CSBA): Eric Edelman was the Under Secretary of Defense for Policy between 2005 and early 2009. In this role, he was responsible for the vapid, unmemorable 2006 QDR, which is perhaps why Congress demanded the establishment of an independent review panel to “analyze” subsequent QDRs. Now he serves as Distinguished Fellow at CSBA, an organization long associated with promoting the Pentagon’s equally flawed theory of a high-tech, high-cost Revolution in Military Affairs (RMA), whose contemporary incarnation in using robotic drones in a collateral-damage-prone strategy to assassinate Taliban and al Qaeda leaders is creating enemies faster than we can kill them. * Heritage Foundation: James Talent, the former Senator from Missouri and long time porker for McDonnel-Douglas-Boeing (St Louis), one of our largest defense contractors. The Heritage Foundation has ceaselessly flogged the “benefits” of ever growing defense budgets, since it produced its only critical report, “Ending Defense Stagnation” in 1982. Since then, to the best of my knowledge, it has not produced a study that questioned the Pentagon’s inability to pass financial audits in accordance with the requirements of the Chief Financial Officers Act of 1990, not to mention the Constitution -- apparently setting aside the supposed conservative predilection of preserving the original intent of the Framers of the Constitution. * Institute for Defense Analysis (IDA): General Larry Welch, former Chief of Staff of the AF, did nothing to fix the Air Force’s airplane aging problem when he had a chance to shape the Air Force’s future. As President of IDA, he headed up a not for profit organization whose main customer was the Office of the Secretary of Defense in the Pentagon. During his tenure, the IDA economic analysis office produced no recommendations that would have made the Pentagon’s books more auditable or dealt constructively with the power games causing the meltdown, particularly the cynical use of “learning curves” to support the Pentagon’s front loading operations. * Center For Naval Analysis (CNA): A not for profit thinktank that is effectively a wholly-owned subsidiary of the US Navy. So, there we have it: 17 out of 20 members of the QDR review panel have close ties to the status quo Military - Industrial - Congressional Complex. None of them, to the best of my knowledge, has ever discussed, much less analyzed, the three interconnected problems that have produced the Defense Death Spiral or the stunningly flawed QDRs. None of these people have ever tried to step up to the hard decisions needed to fix these problems. Of the remaining three members of the panel, the only one I have any familiarity with is Lt General Paul Van Riper, a former reformer and I believe a truth teller (even reformers occasionally make general). But even if he tries to fix things and the other two members side with him, my guess is that the three of them will be voices in the wilderness and have little or no impact on the outcome -- too much money is at stake, and the 17 other members of the panel are card carrying protectors of the status quo. A QDR review panel where at least 17 out of 20 members have a vested interest in protecting the status quo certainly will not ask the question: Is there an alternative to protecting the status quo? For what it is worth, here is my answer. Probably the only way to incentivize the Pentagon to really clean up its act will be to take the money away and force it to think. Some naysayers might argue that we can not freeze the defense budget, because we are at war, and we must support the troops. This is an emotional red herring. It is a suicidal logic that implies we should continue a dysfunctional status quo that will make us ever weaker, because we are at war. If deemed necessary, we could always continue a variation of Mad King George’s practice of paying for these wars on a pay as you go basis through supplemental appropriations (which in contrast to my proposal, he used to protect the self-destructive status quo by pumping up the core budget). Other naysayers might argue that reducing the budget by two percent per year will gut the Pentagon, because the Pentagon is not required to pass an audit until 2018, and the compound effect of -2% per a year for eight years would be devastating. This kind of claptrap is precisely the kind of non-thinking that works to perpetuate the status quo. With deadlines like 2018, the Pentagon has no incentive to clean up its act. Moreover, the MICC has a habit of pushing inconvenient deadlines ever further into the future. Consider the track record of how the Pentagon routinely “bow waved” its auditing problems into the future: John Hamre was Chief Financial Officer (i.e. Comptroller) of the Pentagon in the early 1990s during the Clinton Administration; in that capacity, he promised Congress he would fix the books by 1997, a promise that was conveniently forgotten when 1997 arrived. When Dov Zakheim became the first DoD Chief Financial Officer in Bush administration in 2001, he promised to fix the books by 2007. Zakheim’s successor in the Bush Administration, the inept and eminently forgettable Tina Jonas, extended Zakheim’s promise to fix the books by 2016. Congress has now told Obama’s Comptroller, Robert Hale, to fix the books by 2018. So, given the Pentagon’s behavior and the makeup of the panel, how much do you want to bet that the QDR review panel even mentions, let alone tackles a bookkeeping issue that is widely acknowledged but has been treated with contempt by decision makers in the Pentagon and Congress for at least fifteen years? This behavior is nothing less than a systematic assault on the Appropriations and Accountability Clauses of the Constitution (see Article I, Section 9, Clause 7), which each member of the Defense Department has taken a sacred oath to defend and uphold. That is why the MICC’s desire to feed its voracious appetite by continuing its assault on the Constitution reflects exactly the kind of misplaced power that President Eisenhower warned America about in his farewell address.